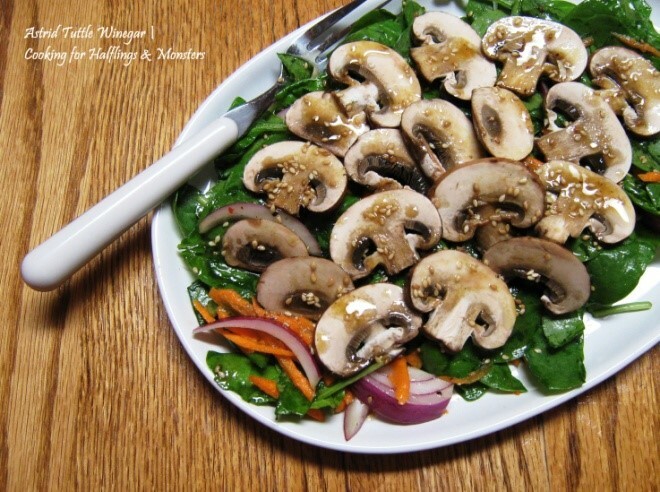 It’s springtime and the weather is warm—so it’s the perfect time to make a mushroom salad for lunch or dinner! If you’re in a questing mood, you could try finding more exotic mushrooms; to make your salad sparkle, you could justify buying some chanterelles, enokis, or oysters for fun. If you can find some Hen of the Woods, you’ll feel like you’re in Middle-earth. I know hobbits will just head outside and forage in a nearby forest, but you’d do better to buy your mushrooms from your local grocery. In a shaker jar with a tight-fitting lid, combine the oil, sugar, vinegar, sesame seeds, soy, mustard, marinade, and “Shire” Seasoning and shake well. Place the spinach, carrots, and onion in a large bowl. Toss ¼ cup of the dressing with this and sprinkle with the freshly ground pepper. Arrange on a platter. Arrange the mushrooms on top of spinach mixture. Pour remaining dressing over the mushrooms. Serve immediately. Not recommended as leftovers. Serves 4-6. This is known as “Ted’s Spinach Mushroom Salad” in my cookbook.